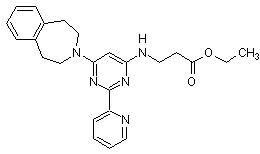 Cell permeable histone demethylase JMJD3/UTX inhibitor. Attenuates LPS-induced proinflammatory cytokine production in macrophages (IC50 = 9 μM, TNF-α release). Prodrug of GSK-J1. Rapidly hydrolyzes to GSK-J1 intracellularly. Publishing research using ab144395? Please let us know so that we can cite the reference in this datasheet. There are currently no Customer reviews or Questions for ab144395.